After talking about it, and saving up for it, since I first heard that it was being released – I’ve finally got it! And the ‘IT’ in question is a Silhouette Cameo. 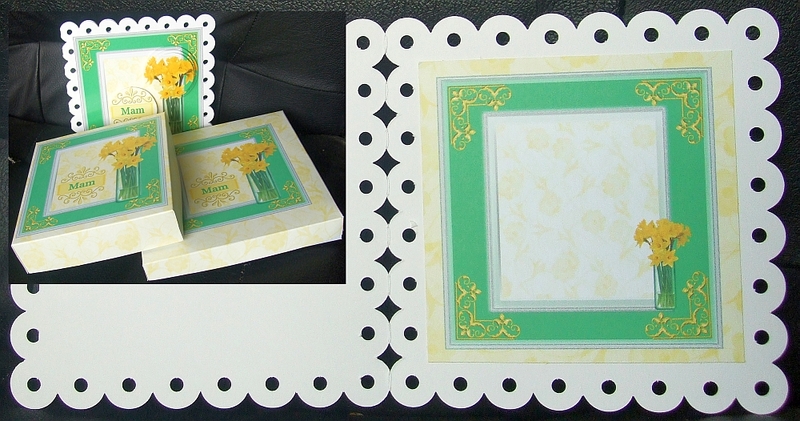 Having had the CraftROBO 330-20 for a few years, and loved the crafting I’m able to do with it, when I heard that the new Cameo had a larger cutting mat (and was therefore able to cut out larger items), and had a stronger motor (and was therefore able to cut heavier weight cardstock) I knew it was time to save up to upgrade to this new machine. 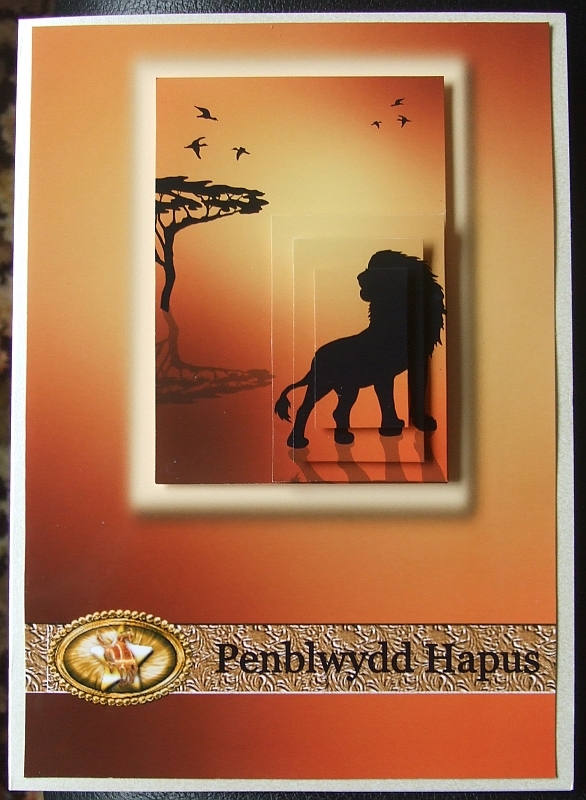 Being a member of the Create & Craft Club, and having the 10% discount, plus the fact that, as this is a larger item, it is available on flexipay, I decided to order it from there. Ordered on the 26th, delivered on the 30th. That’s good going for delivery from C & C.
Sorry, but I haven’t actually made any cards today. I’ve been too busy “playing” with cutting out different things to see how my new Cameo works with different media. I’ve ended the day with a tray of pieces that I’ll need to use to make up cards over the next few days. 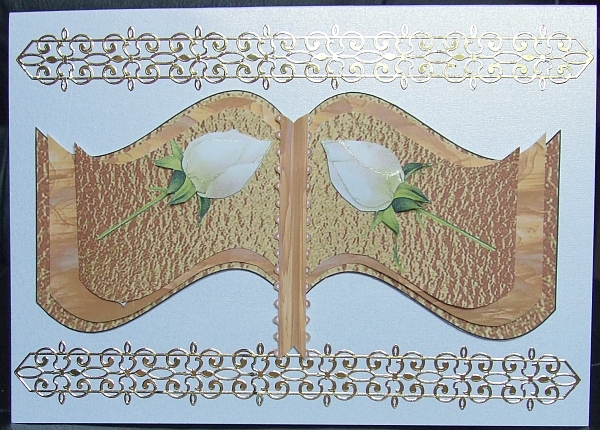 These include: keys from silver mirror paper; swirls to shape into flowers from iridescent gold vellum; an assortment of items, that include a fine lattice window, a silhouette of a couple dancing, small flowers, a card with a decorative edge, from purple satin card; letters that I first drew the shape with a blue silhouette pen and then cut out a mm outside to create the letter, from 170gsm good paper; a print and then cut tractor from 120gsm good quality paper; red and orange flower layer shapes from 80 to 100gsm photocopier paper. Hopefully I’ll have some time to put them together over the next few days and you can see the finished effect. CUP Discount Code – The discount code “BINGO” is still valid until Midnight GMT, on the 31st, January 2012, therefore there’s still a tiny bit of time to add some digital downloads to your digital library from the vast number of crafting items available on craftsUprint. And if you don’t like to download and print out your own sheets for crafting, then don’t forget that craftsUprint now offers to “Print & Post” lots of designs, so you can have a design printed onto good quality paper posted directly to your home. CUP Newsletter Mailer – The main, showcase, section is given over to the work of Silver Designers in the mailer sent out on Monday 30th. Please click – here – to go and have a look at an online version of the mailer and have a look at all the designs and CUP news. Please feel free to leave me a comment. I really appreciate every one I receive. Following a spait of advertising Spam that’s totally unrelated to my crafting blog youll notice that comments dont go live the minute you post them, as I now moderate all comments before they go live. Right, I’m back with the other two cards I should have posted their pictures up yesterday but a bit of a mix up when I was taking pictures meant I’d missed them all-together. The light conditions were not fantastic for taking photos today, but I managed to get some between the clouds. 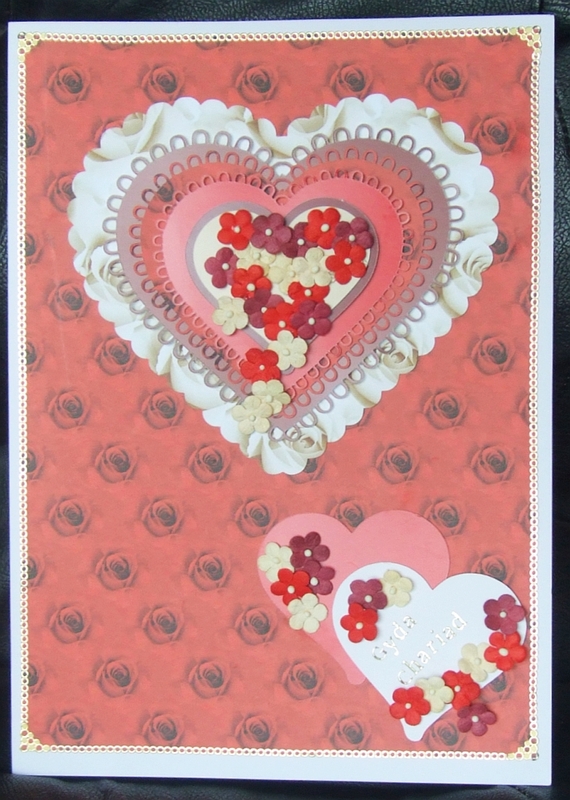 I’ve also made another card using a digital download printed onto card and then decorated with further die-cuts from my crafty stash. 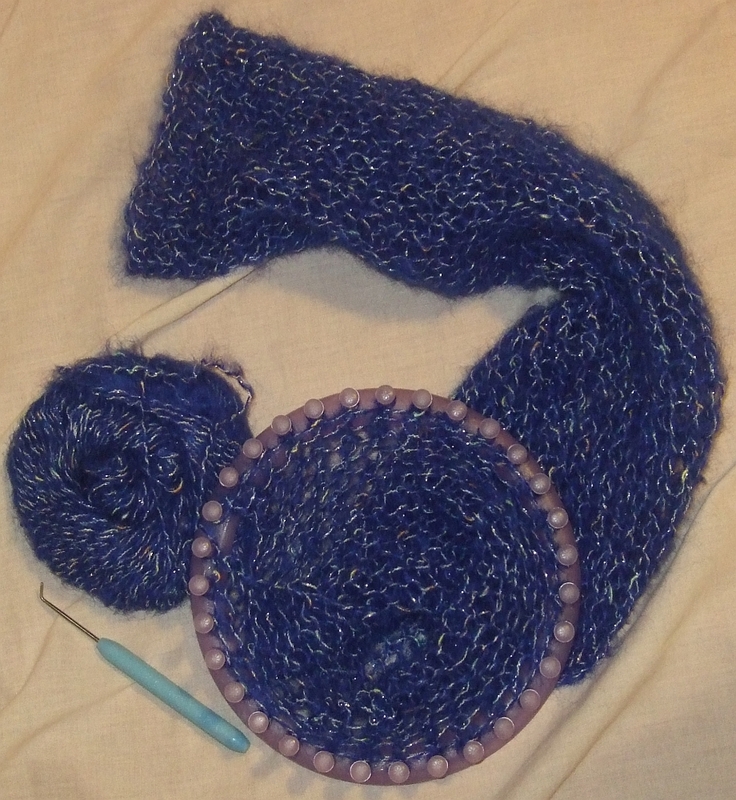 I’ve also put up a picture of the finished scarf I’ve made. 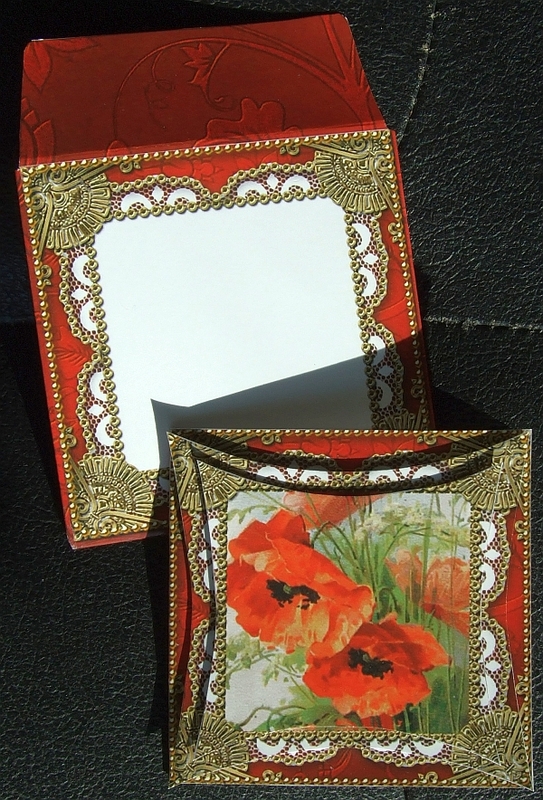 Mostly raiding my crafty stash of die-cut decoupage, etc., but shaped, cut, put together, etc., with my own touch of ideas. 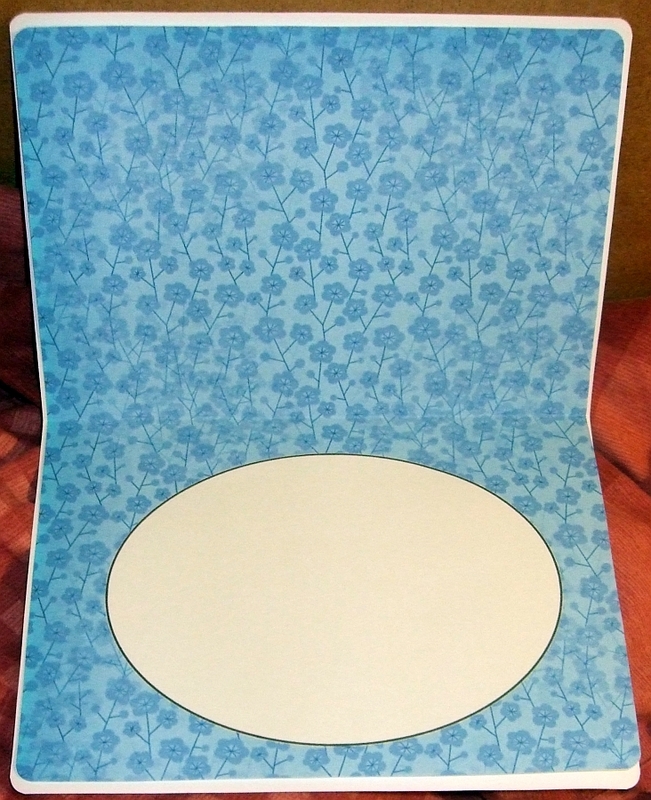 Blue floral insert by Sharon Poore (This is the insert I put in the card above. It was printed onto good quality, 100gsm, white paper. I’ve left it without a greeting so that there’s enough space for a hand written greeting). Back on the 7th of January I put up a post that showed a hat I’d knitted on a circular knitting loom, a pair of fingerless gloves I’d knitted on a smaller circular knitting loom, and this – – the start of a scarf (colour looked a bit dark due to the different light conditions at the time the photo was taken). Well, the scarf is now finished and can be seen to the right. Nice and light and fluffy, it weighs less than 100gms but it’s lovely and warm. You can see the other, matching, items in the earlier post by clicking – here. CUP Discount Code – Don’t forget that theres an end of month promotion currently running on the craftsUprint site. Simply type the word BINGO into the REDEEM VOUCHER box on the basket page before you check out then click UPDATE BASKET to save a whopping 20% off your total order value! Yes! You read that right! A 20% Discount! The code expires on the 31st, January 2012 at Midnight GMT, so you have a bit of time to browse around and make your choices. 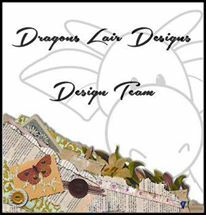 So if you are into digistamps, Iris Folding, decoupage, Paper Piercing / Ornare, Tea Bag folding, Stackers, Shakers, and so much more, you are sure to find something that will be useful in your cardmaking on the craftsUprint site. And if you are looking for some sort of digital design and can’t find something suitable on the site you can always “Ask a Designer” on Craftforums. craftsUprint’s sister site, Craftforums, is a wonderful forum where crafters interact and chat, not only with other crafters but with the designers of the digital work we buy from craftsUprint. 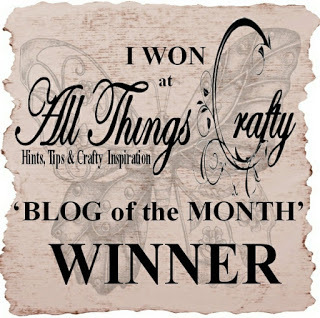 The Ask An Expert / Designer forum area is the place where a crafter can post if they are looking for something specific but can’t find it on craftsUprint. 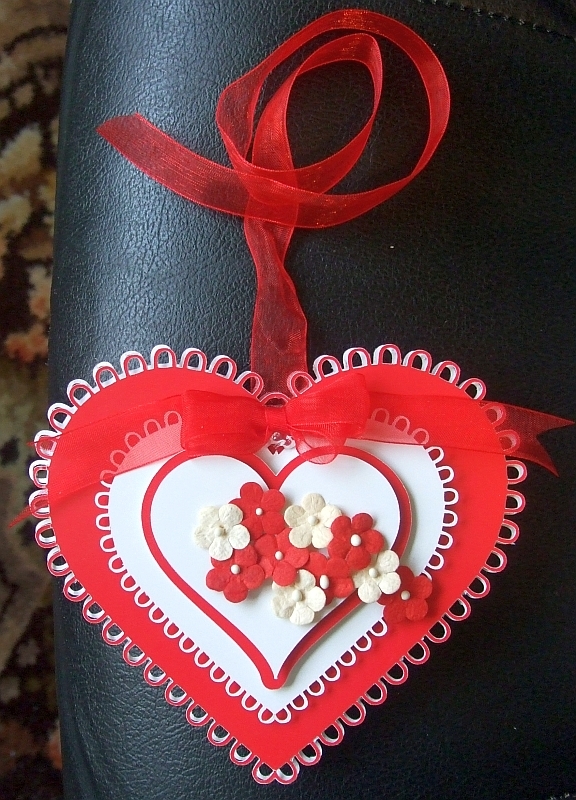 Designers then know what crafters are actually looking for, and any who are able can design and upload a suitable design to CUP for crafters to buy. This forum area is also handy if a crafter needs specific help with a particular design, when not only will the original designer have the chance to help, but other crafters who may already have made up the design (or something similar) are able to help out from their own experience. Craftforums also has a lot of other “Departments”, forum areas, and includes a whole section of “Card Making Tutorials”. So pop over to have a look, and join to get involved. Youll notice that comments dont go live the minute you post them as I now moderate all comments before they go live. I wanted to make something on Friday, and with 4 birthdays in the family in February I felt I should make a start on something suitable. 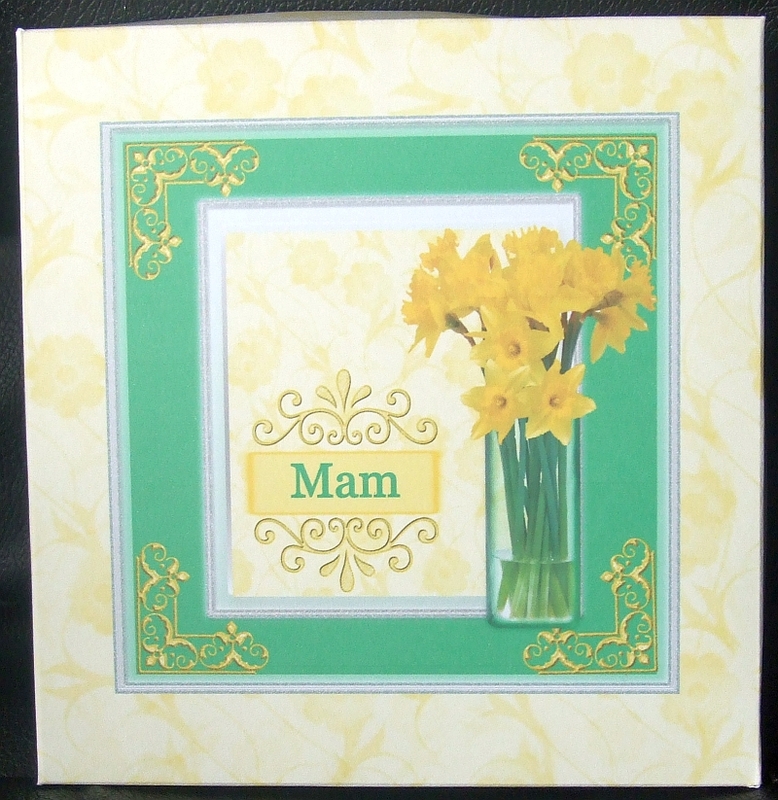 Plus – my mother had already mentioned that she’d be needing some cards to send to the same people as well. But I wasn’t feeling up to doing much, or had much inspiration of what to make either. So I raided my box of bought in, die-cut, sheets of designs and dipped in to see what I’d come up with. I landed up with 6 cards by the end of the day. Unfortunately, when I was taking pictures of the cards I’d made, I got a bit mixed up between the bundles of those I’d taken and not taken pictures of and landed up with two lots of pictures of four of the cards and no pictures of the others. I would have taken pictures of the rest today but some of the family members, who a couple of the cards are for, were here all day so I couldn’t get the cards out without them seeing them before their birthdays. So in this blog post you’ll just see pictures of 4 cards. I’ll get photos of the rest and upload them as soon as I’m able. 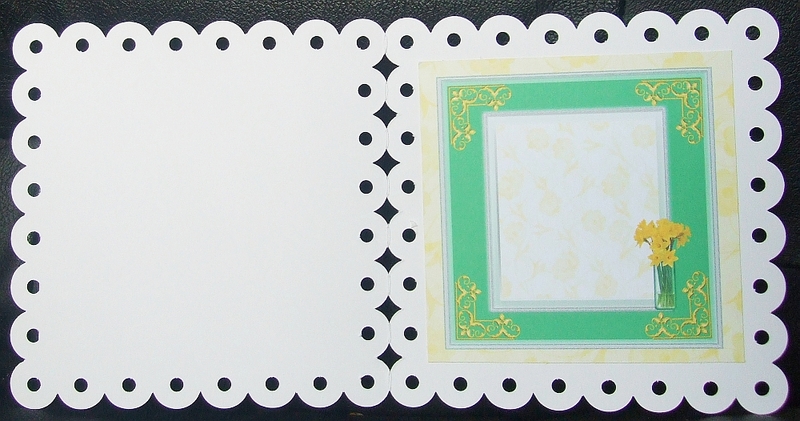 This first batch of two cards are made using die-cut sheets and background sheets from Doolicraft. They feature members of the McDooli Clan. 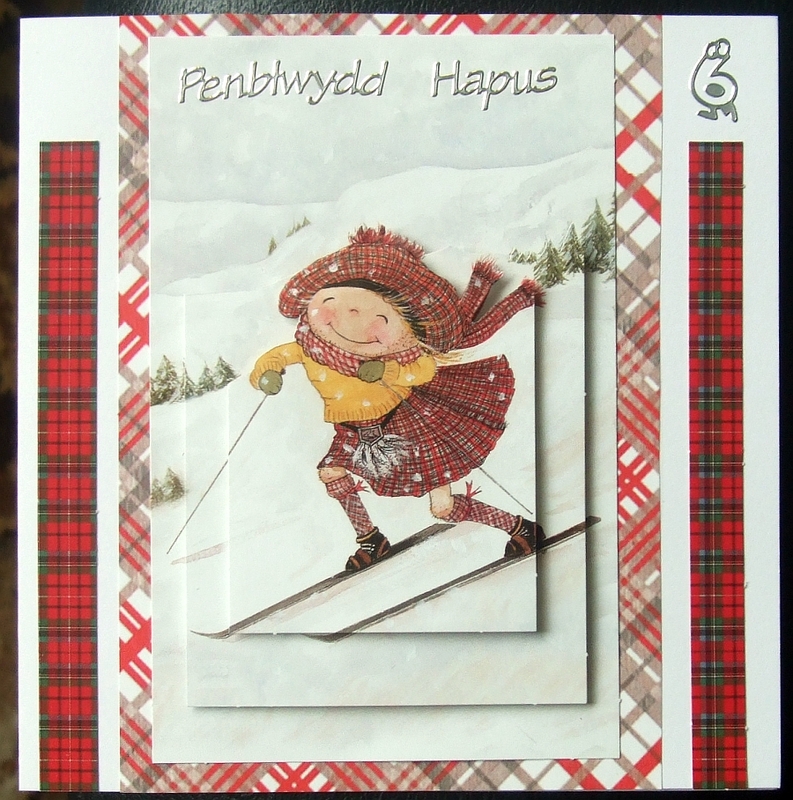 This is made up on a square card with some tartan background paper and tartan paper ribbon. Just used 2mm deep, double sided, foam tape to build up the pyramid. 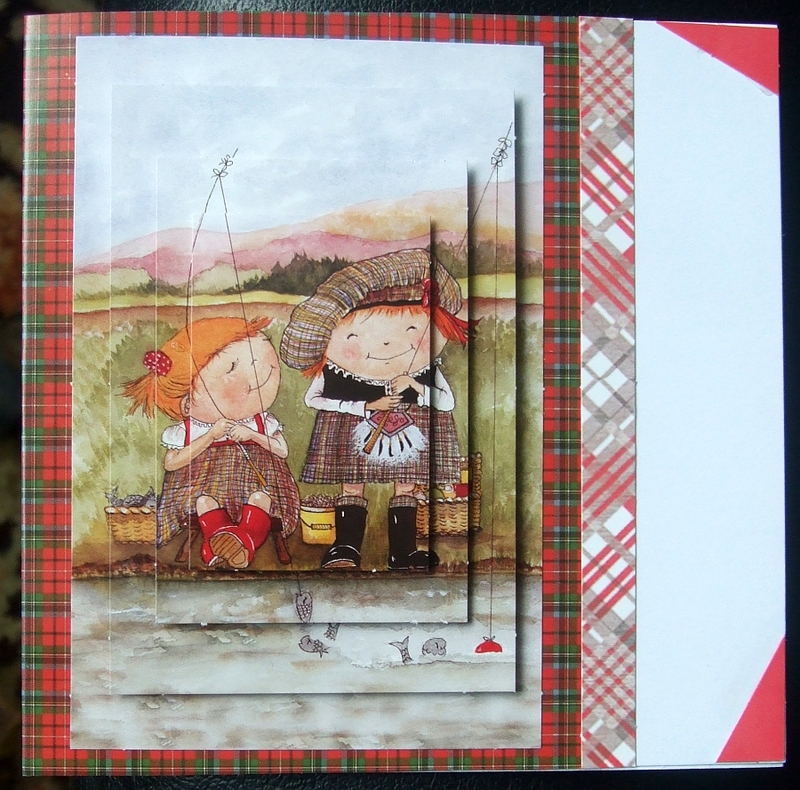 Also made up on a square card with tartan background, this time put in the centre rather than the side, with two strips of tartan paper ribbon either side. 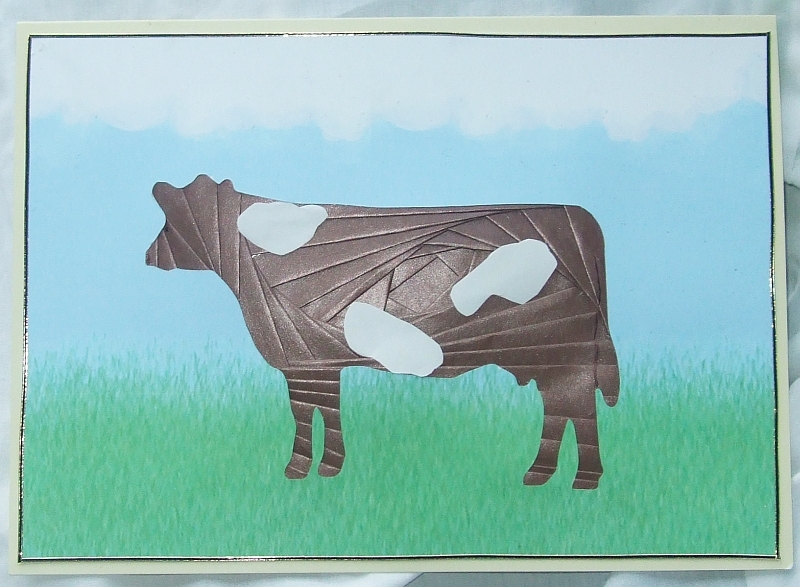 This time, although the design was an oblong pyramage, I trimmed off the top of the layers around some of the background contours and hat to give some added shape, without having to go to the bother of cutting out individual elements to make a decoupage. 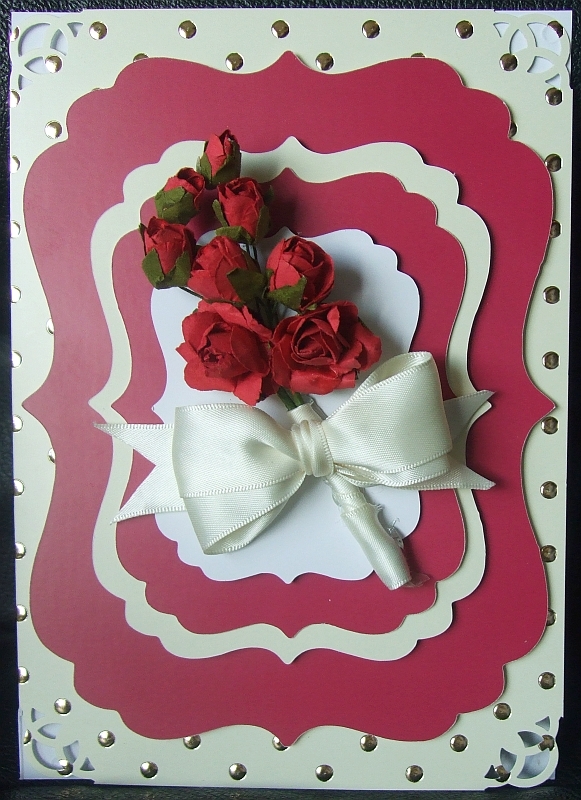 This second batch of cards were made using base cards and die-cut topper sheets that were Create & Craft branded. 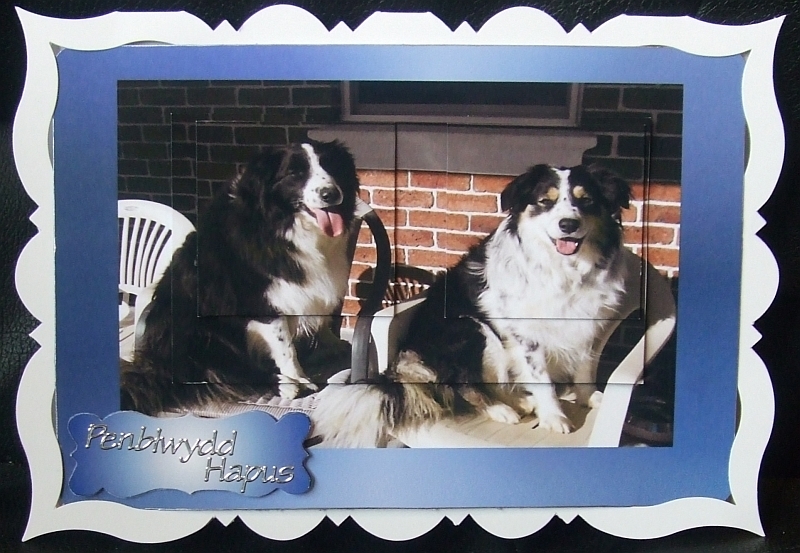 The card base itself was to make a tent like card with a base, but I scored the middle panel along the centre and stuck the base image layer to one side of it to make an easel card. I used foam tape for attaching the bottom layers of the decoupage and glue gel for the top layers after giving them some shaping. 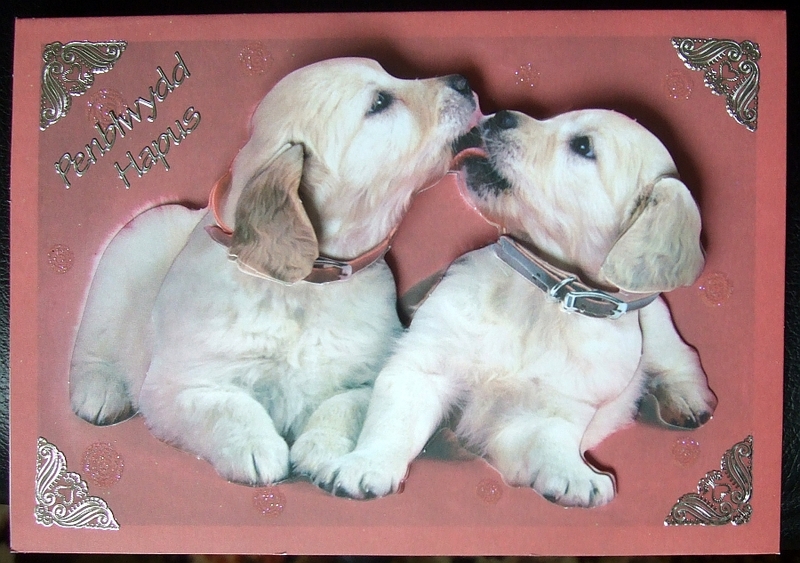 I used some corner peeloffs as decoration on this card. 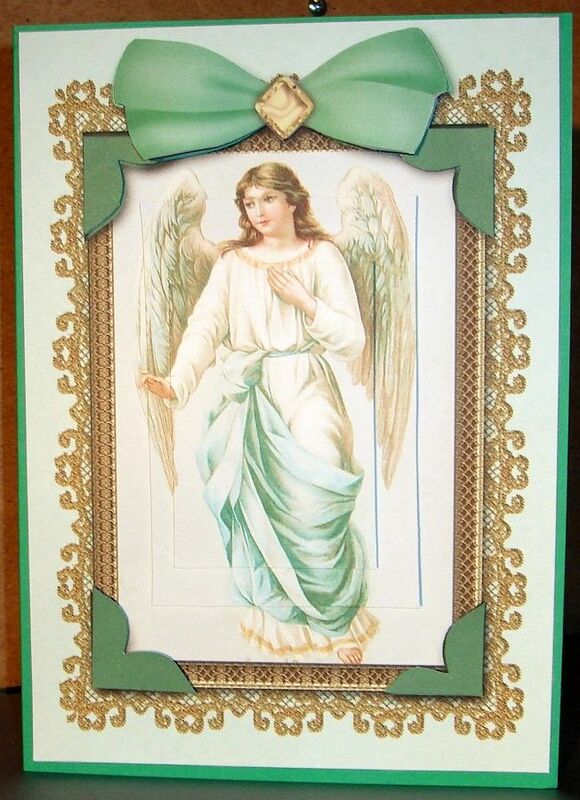 For this card I trimmed off one of the panels to leave an ordinary, tent fold, base card, decorated the corners with corner peeloffs and put on a greetings peel-off, then used foam tape and glue gel to attach the decoupage layers. CUP Discount Code – There’s an end of month promotion currently running on the craftsUprint site. Simply type the word ‘BINGO’ into the REDEEM VOUCHER box on the basket page before you check out then click UPDATE BASKET to save a whopping 20% off your total order value! Yes! You read that right! A 20% Discount! So it’s an excellent time to add some more designs to your digital library. 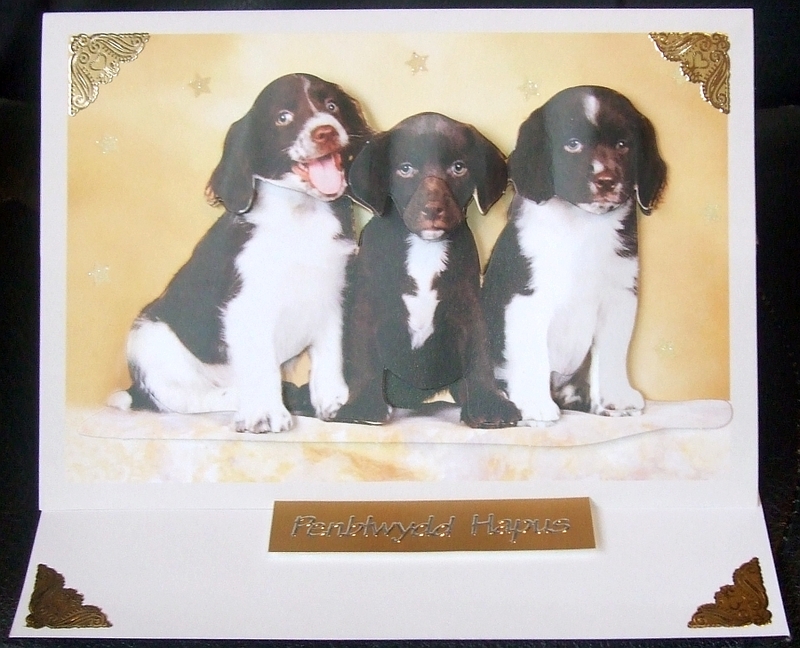 Remember that the digital items available from craftsUprint are not limited to decoupage and pyramage sheets for your card-making. craftsUprint is a site that has backgrounds and inserts, cutting files and knitting patterns, needlework patterns and cross stitch, crochet patterns and scrapbooking. The code expires on the 31st, January 2012 at Midnight GMT, so you have a bit of time to browse around and make your choices. Play Crafty Bob’s Tombola – And there’s another bonus to ordering digital downloads from craftsUprint – Every new order placed will be entitled to a FREE play of Crafty Bob’s Tombola. Everyone wins a prize and over £250 in prizes are given away EVERY DAY! You can see a list of the latest prices given away by clicking – here. CUP Newsletter Mailer – The latest CUP mailer, that was E-mailed out on Friday, 27th January, can be seen by clicking – here. It’s the work of Bronze designers being showcased this time. Plus of course there’s lots of other work on show and lots of news, and if you scroll down to near the bottom of the right hand column you’ll see “Crafty Bob’s Thought For The Weekend”. Can you work out the puzzle? Free Card Verses – Did you know that, amongst all the other items available via the craftsUprint site, there’s now a section giving you the choice of over 3500 free Card Verses? 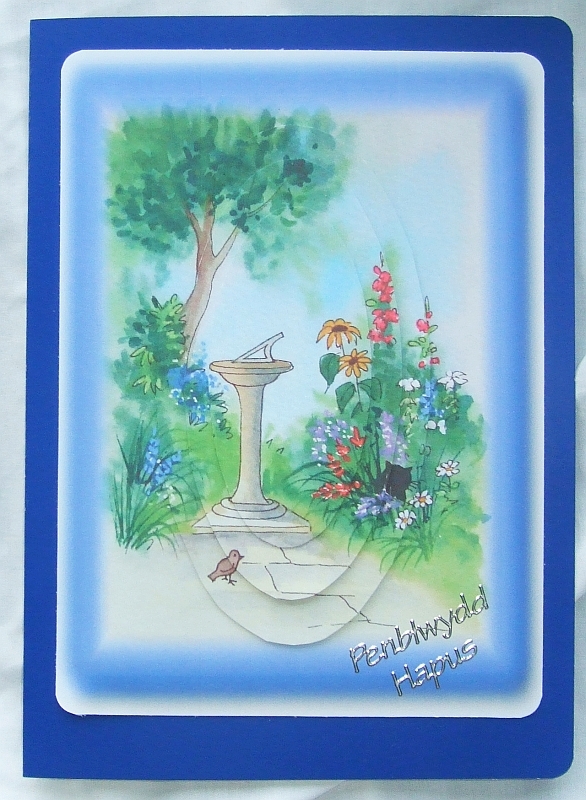 So if you are struggling for the right words to put into any of your cards why not pop over – here – for a look. I really appreciate the nice things you’ve said about my crafting efforts. Just Two Cards This Time! Not done a lot of crafting the last couple of days. Haven’t really felt up to doing much, although I’ve got a lot I’m planning in my head, so you’ll have to wait and see what comes out of my head and into paper format over the next few days. 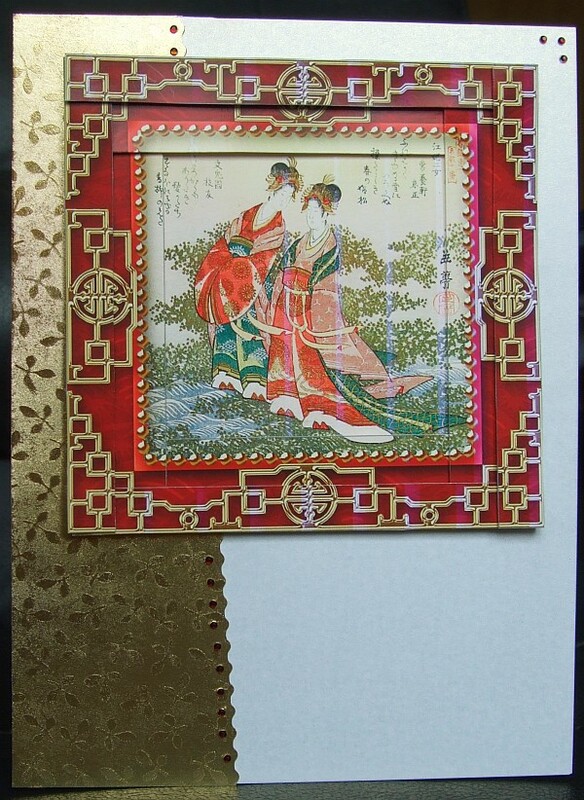 Just two cards this time, but three pictures as one card has a matching insert. I think I really need to use more of the bits and pieces that I’ve got in my crafting stash that I’ve found so far during my mini-clear-up of crafty stuff (which I started back in the autumn and still haven’t finished). I’ve picked up a lot that I’ve forgotten I had over the years, and there’s some lovely bits and bobs there that would make simple finishing touches to some of my cards. The problem is, the couple of boxes of bits and bobs I’ve got seem to be getting fuller as I find things, rather than getting less full as I use things. CUP Newsletter Mailer – A copy of the E-mail that was sent out yesterday, 25th January, can be seen by clicking – here – if you don’t receive it directly to your inbox. 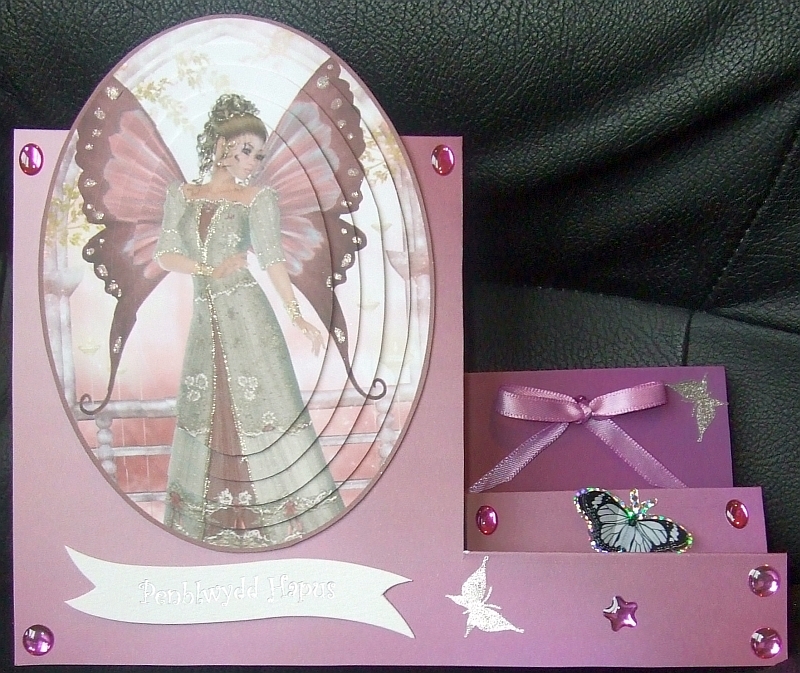 Being showcased in this mailer is some of the work of the “Titanium Trio” – the three top designers who’ve sold the most designs via CUP – and also some cards made by some of the top card makers on CUP. There’s lots of variety to be seen, from humorous to stylish, from children’s to adults. Of course, as usual there’s a lot more bits of news, new CUP TV episode, etc., as well, so do please click through for a look. A BIG Thank You to all you lovely people whove left such nice comments on my various blog posts over the last few weeks. I really appreciate every one of them. 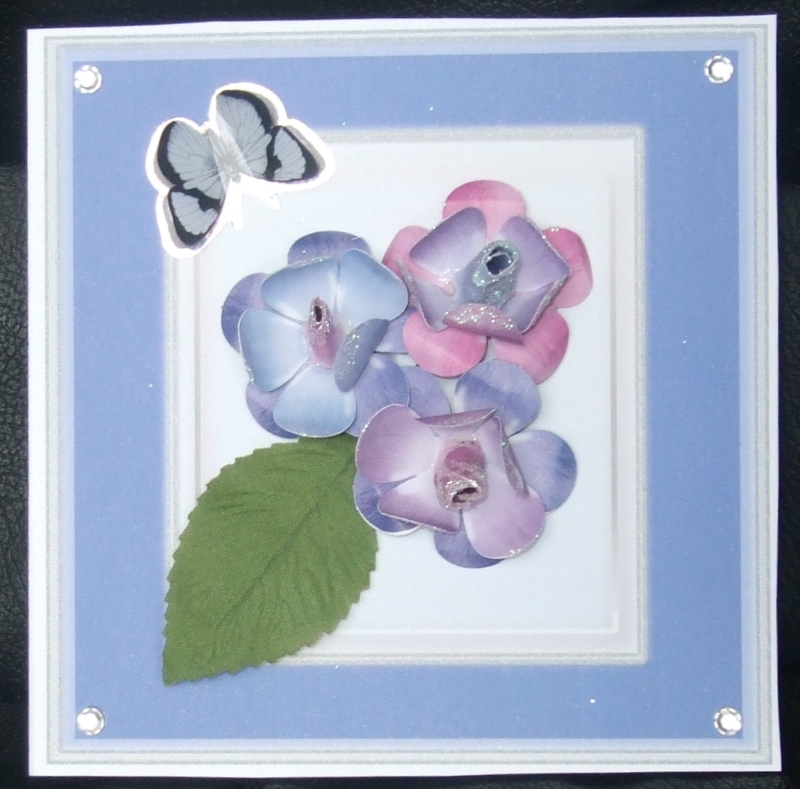 I haven’t made a lot of cards the last few days, but I thought I’d show you what I have done now, rather than waiting until I’d made more before I posted again to my blog. 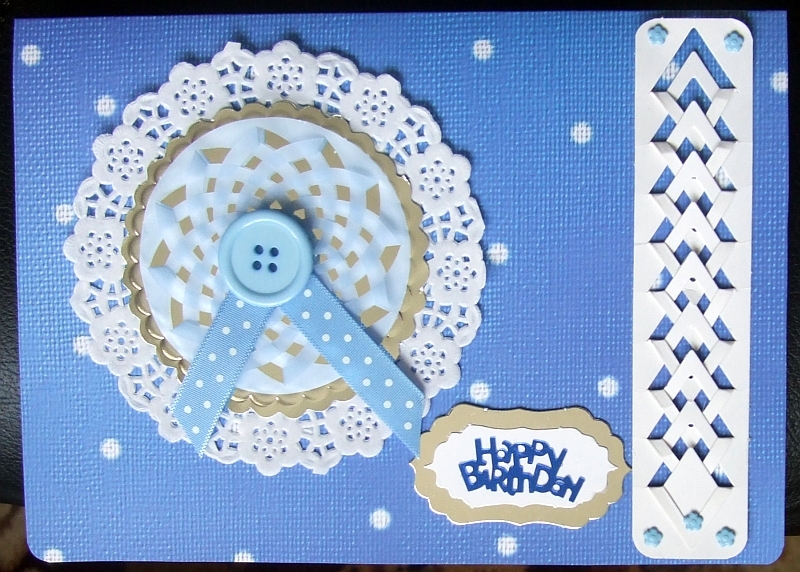 Although all these cards use digital downloads from the craftsUprint site I’ve tried to give them a different look by using different base cards or embellishments with them, to make them my own. I don’t have a particular style, other than the fact that my health and fluctuating disabling conditions do mean that very intricate cutting by hand is out of the question as far as I’m concerned. But the very fact that my dexterity fluctuates does mean that I can manage more some days, and no crafting at other times. CUP Newsletter Mailer – The last mailer was sent out by the staff at craftsUprint HQ on Monday, 23rd January. You can see a copy by clicking – here – if you don’t get it sent directly to your E-mail box. You’ll see lots of designs that you can buy and use in your cardmaking, some of them completely new, lots of news, and the latest CUP TV episode. I made the small number of cards I’m showing you today the same day as those I put up in my previous post, but, as the last post was themed, I kept these for a separate post. 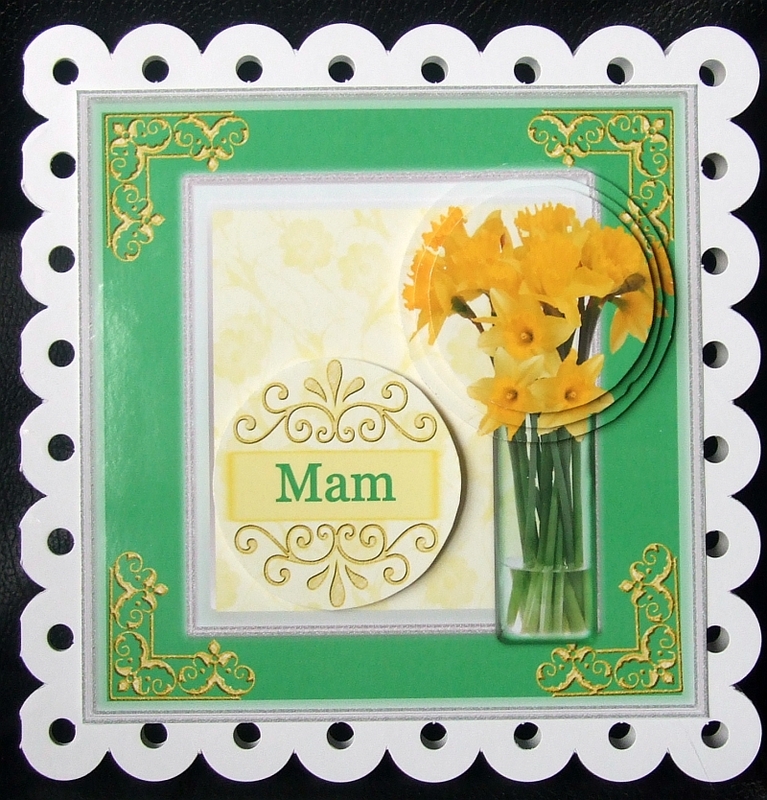 These are a very mixed assortment of cards suitable for lots of different occasions. This is another pair of fingerless gloves, knitted on the same circular knitting loom as the pair I showed you in my blog post of the 7th of January, that you can see by clicking – here – only this time I’ve knitted it in more utilitarian yarn to make a pair to ware to take the dog out, rather than the mohair mix yarn that I’d made the last pair from “for best”. 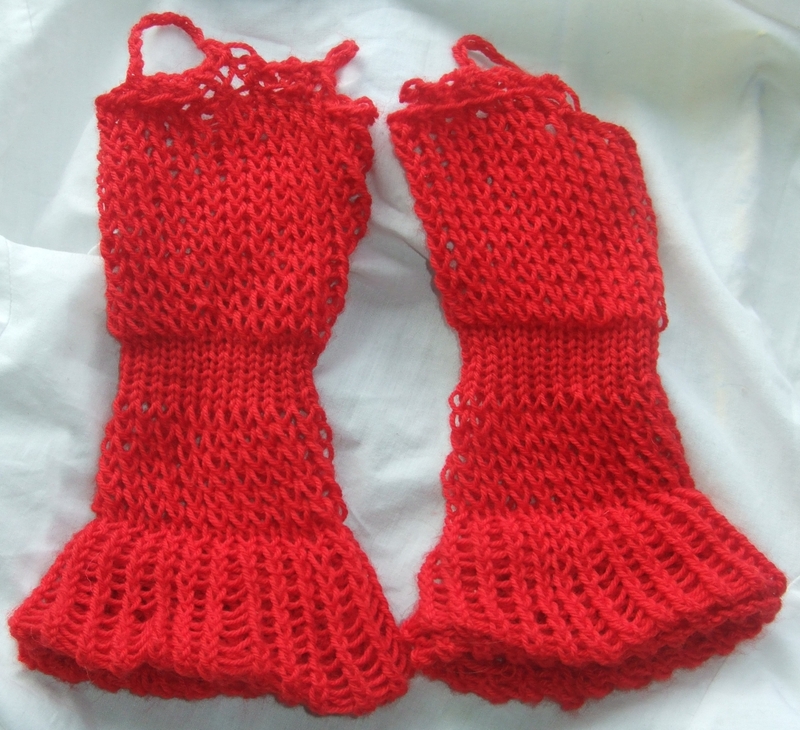 I’m still working on the scarf to go with the original pair of fingerless gloves, but I put it to one side to make this pair of gloves as my hands were freezing one morning when out in the garden with the dog. CUP Newsletter Mailer – If anybody hasn’t seen the mailer sent out by the CUP team on Friday, 20th January, then you can see it by clicking – here. The main showcase section this time are designs created by CUP Exclusive designers who’ve reached the Platinum level by selling 10,000 and more items. You’ll also see the usual “CUP LATEST NEWS” section with lots of snippets of news, so click through to catch up with the latest from CUP land. A big THANK YOU to all you lovely people who’ve left comments on my various blog posts over the last few weeks. I really appreciate every one of them. You may not know it, but in the same way as Valentine is celebrated as a saint for lovers, Wales also has a patron saint of Welsh lovers – and her name is Dwynwen. As Dwynwen lived so long ago there are certain variations to the details when her story is told, but you can read up a bit about her by clicking here -> National Museum of Wales; Cadwyn; Historic UK. 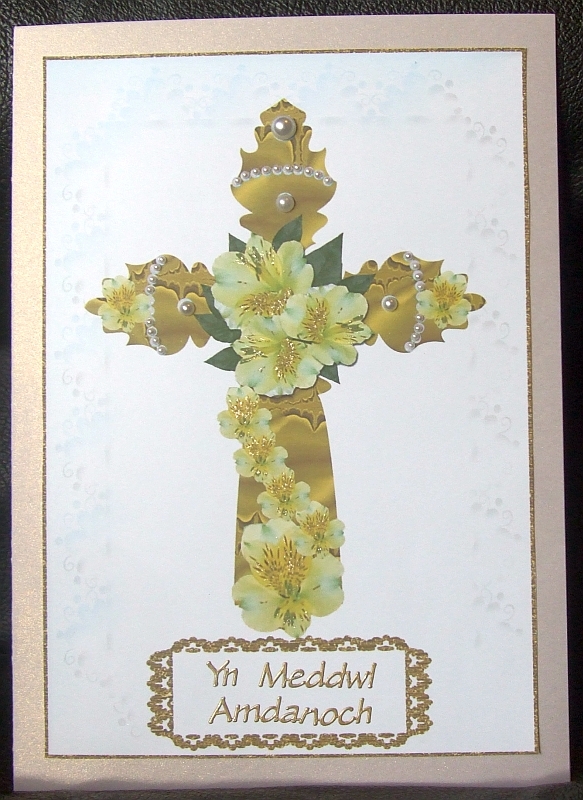 St. Dwynwen’s Day is the 25th of January, so I decided to put together a few ideas for cards for the occasion now as there’s less than a week to go if you plan on celebrating with a card and a gift. 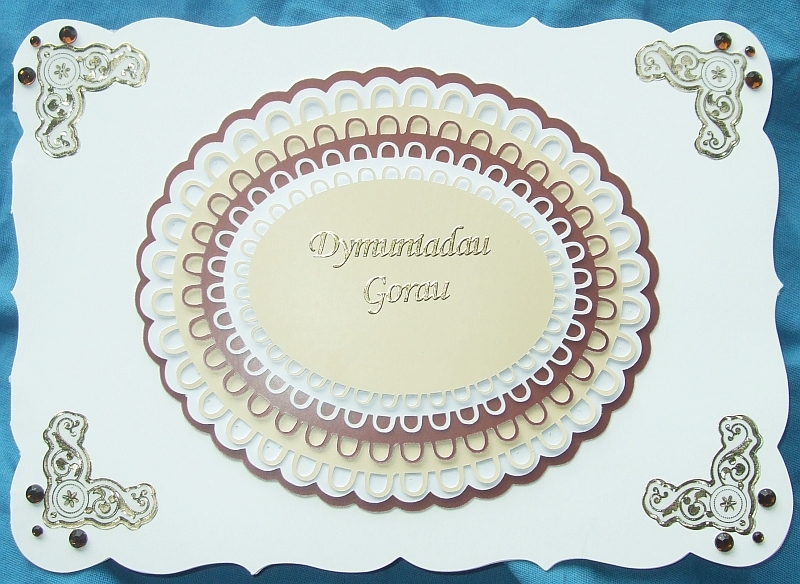 I’ve purposely just put “Gyda Chariad” (Welsh for “With Love”) on these card so they could be used for either St. Dwynwen’s Day or St. Valentine’s Day. 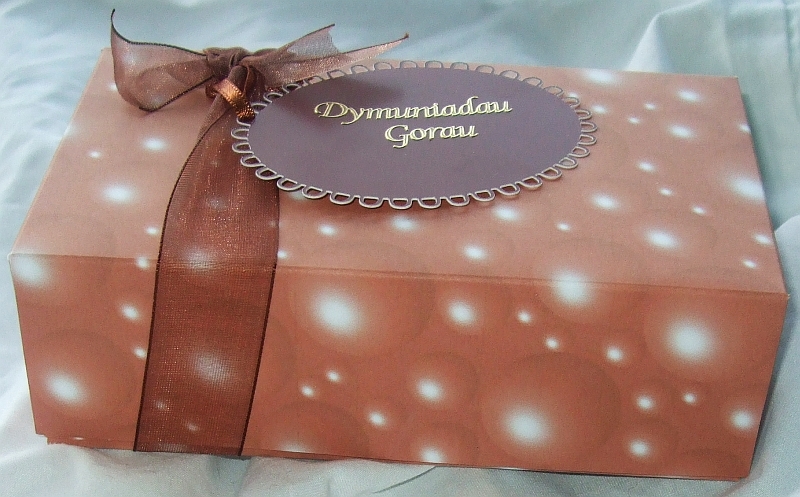 I’ve made lots of boxes for various things from various pieces of jewellery to hand made chocolates, but today’s box is made of a card printed with a bubbly chocolate design and hides a box of chocolate truffles. A perfect packaging to make a small gift look extra special. 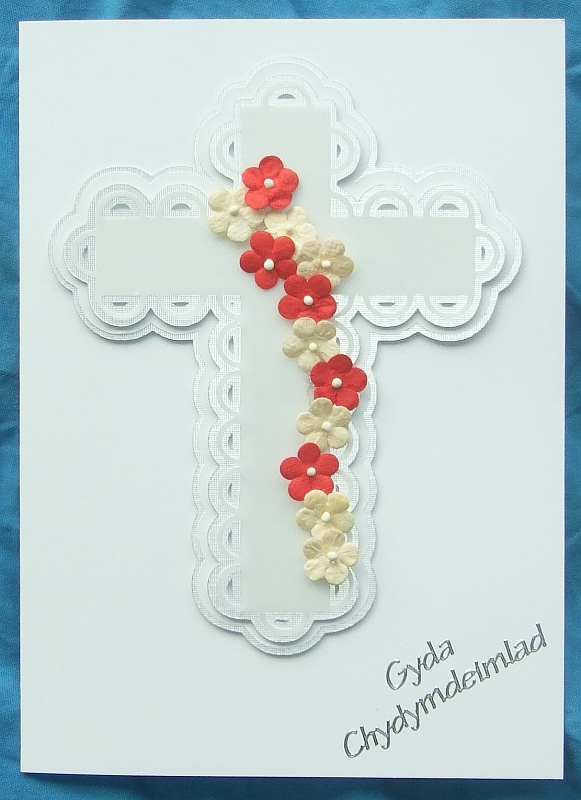 A perfect gift for St. Dwynwen’s Day. I’ve purposely kept the tones of embelishments to brown so it’s a suitable box to send a gift to a man, not just a woman. You could even make the box a bit deeper than the box of chocolates and pop a Love Spoon in on top. CUP Newsletter Mailer – A copy of the latest mailer sent out from CUP HQ (dated Wednesday, 18th January) can be seen by clicking – here. The designs of some of the craftsUprint Gold designers are being showcased. 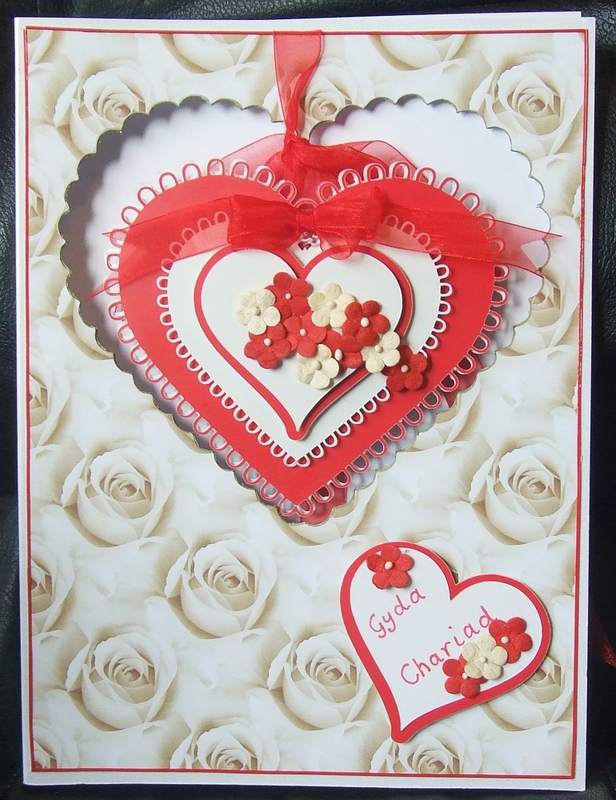 I you celebrate St. Valentine’s Day, not St. Dwynwen’s Day, then there’s lots of designs suitable for the occasion to be seen – although some of the designs are very suitable for both occasions. Of course you’ll find a lot more in the mailer, so please do click through for a look. 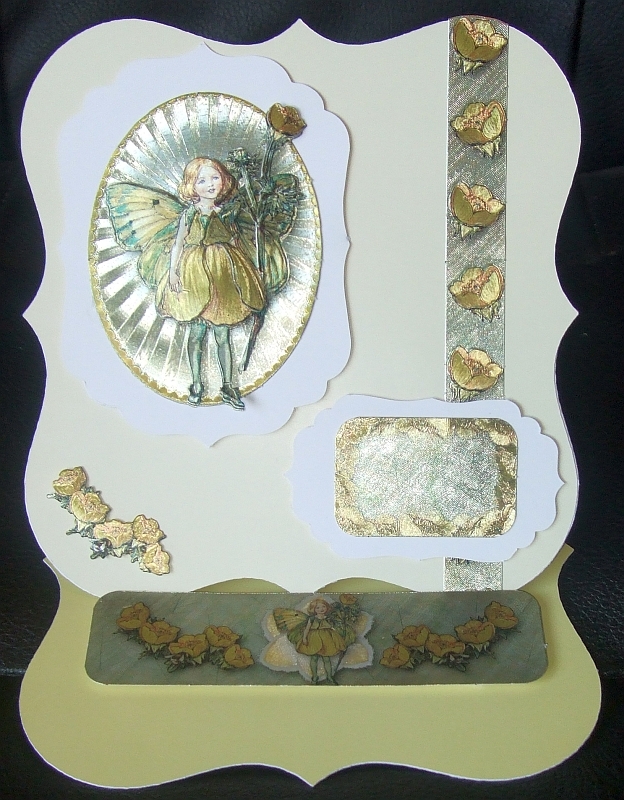 A topper design I’ve been playing around creating using Designer Resources from craftsUprint, used in conjunction with a background from a kit in the CUP Card Making section printed onto card-stock to make the box lids. 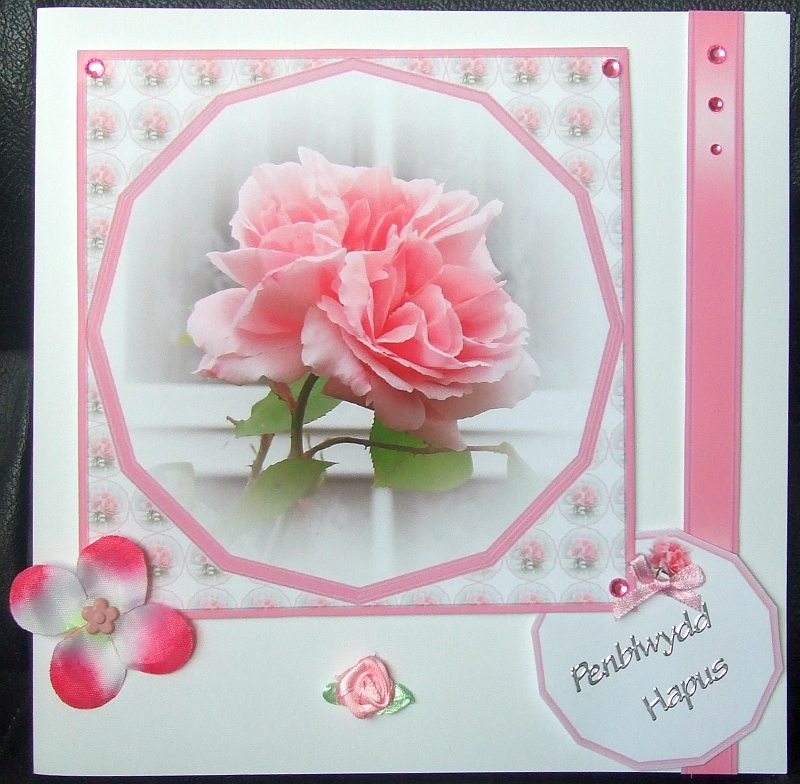 Card made using a topper I created using Designer Resources as below stuck onto a bought in Hunkydory base card with a decorative edge. The topper has a small round pyramid of a few layers over the daffodil heads. 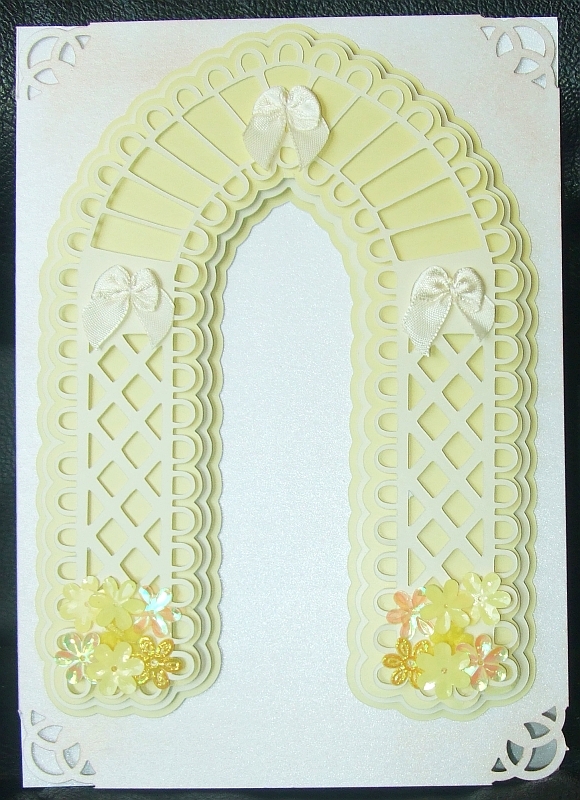 Insert to the card above made using the same Designer Resources but with the daffodils shrunk down and the greetings panel removed so that there’s a nice, clear, area for a greeting to be written inside the card. 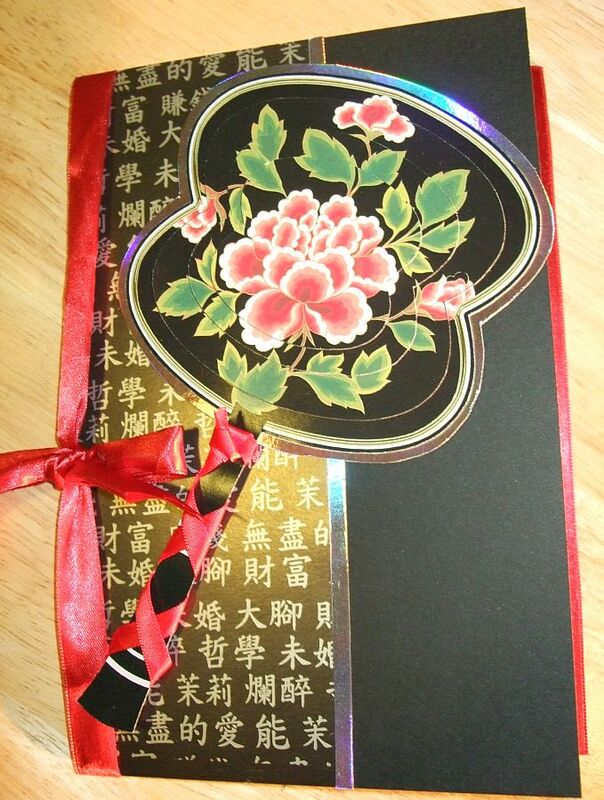 A box to place the card in. 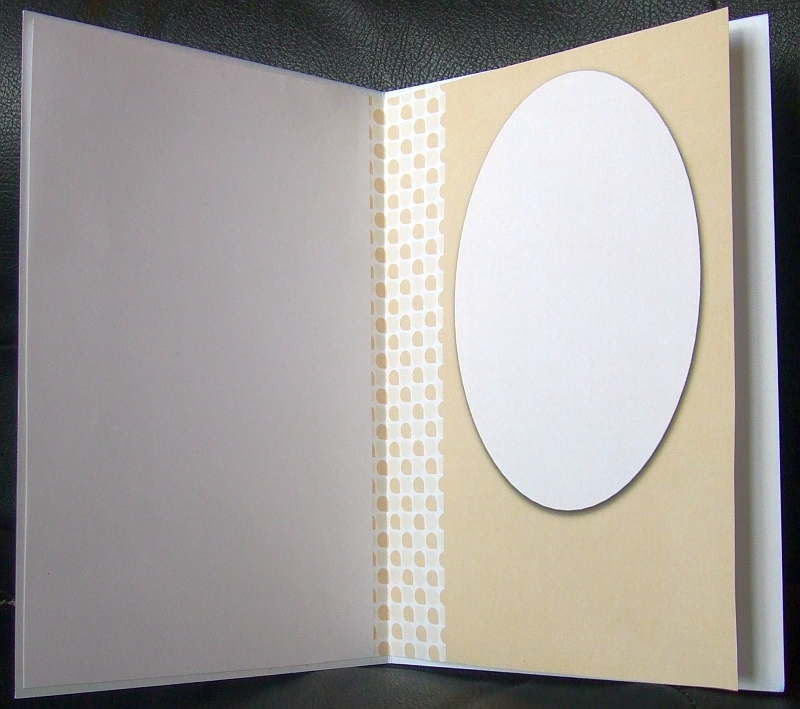 The lid is one of the backgrounds from the kit listed below printed onto cardstock with the same topper as on the card on top, but without the layering, stuck on top. 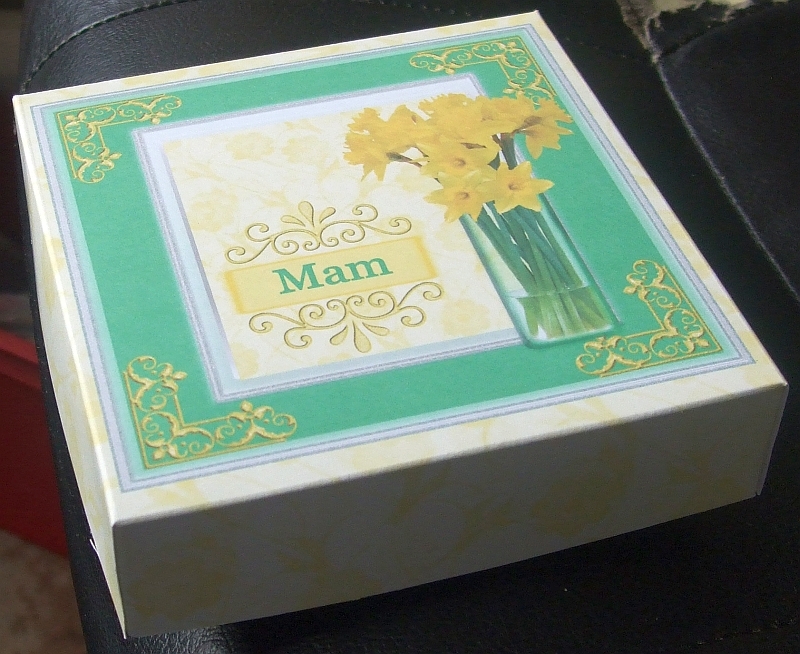 A similar box, but this time a gift box that’s deep enough for a little gift, such as some hand made chocolates. Made exactly the same way as the card box, but this time scoring so that the depth is deeper but the dimensions across the top are smaller. All four matching items together. 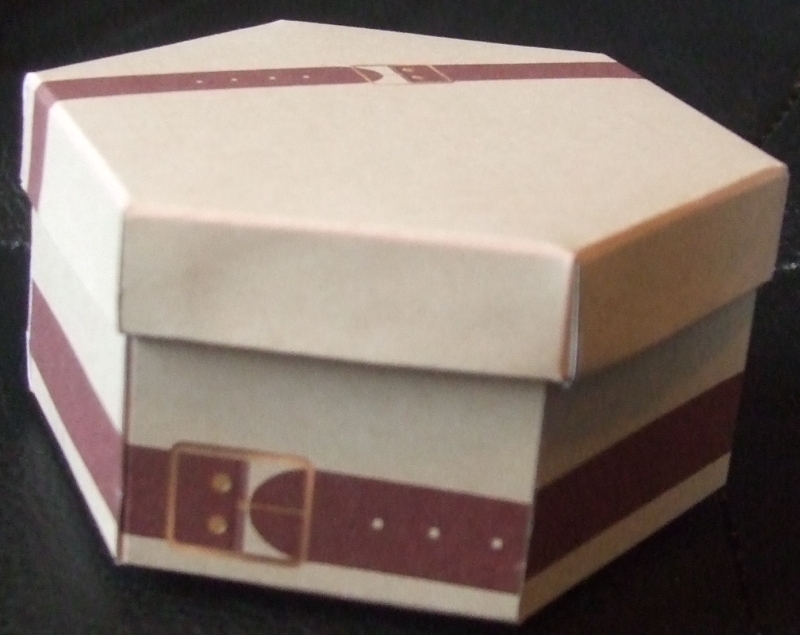 And to finish off, something quite simple, but dimensional, so it will also need a little card box or envelobox made to send it in. CUP Newsletter Mailer – The last mailer sent out by the CUP Team on Monday, 16th January, can be seen by clicking – here. 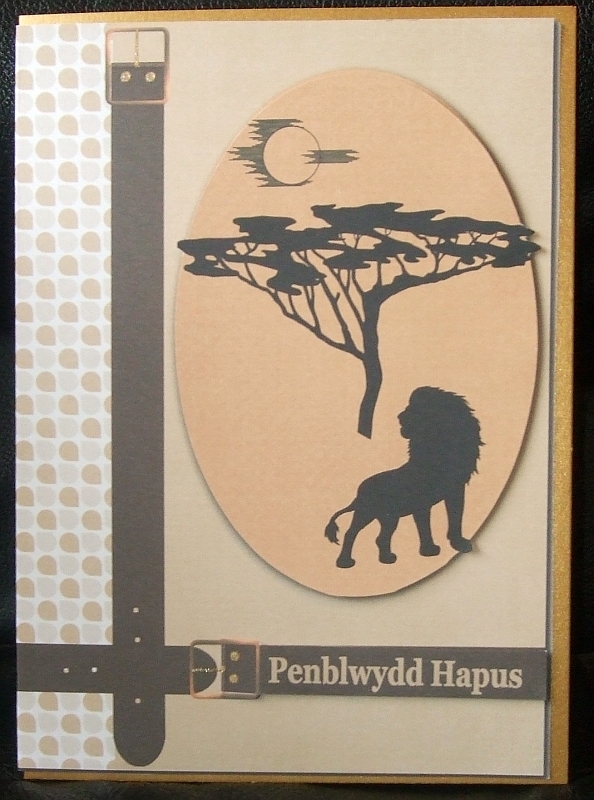 As usual there’s a lot of varied designs being showcased, this time the work of the craftsUprint Gold designers. 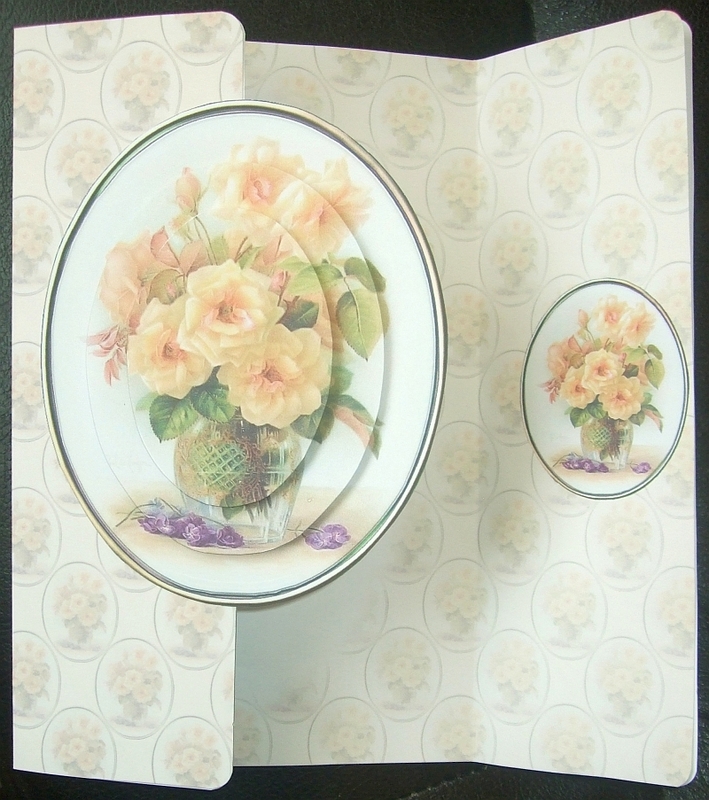 The latest CUP TV Episode is showing how to make up a Gatefold Spring Down Card that’s been cut using a digital cutting machine. Was feeling a bit exhausted and not up to cutting out anything using either a scissors or a craft knife, so I got my CraftROBO out, connected it to my Laptop computer and set it to work. The base cards for the five cards I made were either cut out using the CraftROBO, a pre-made card, or simply an A4 sheet of card scored and folded. 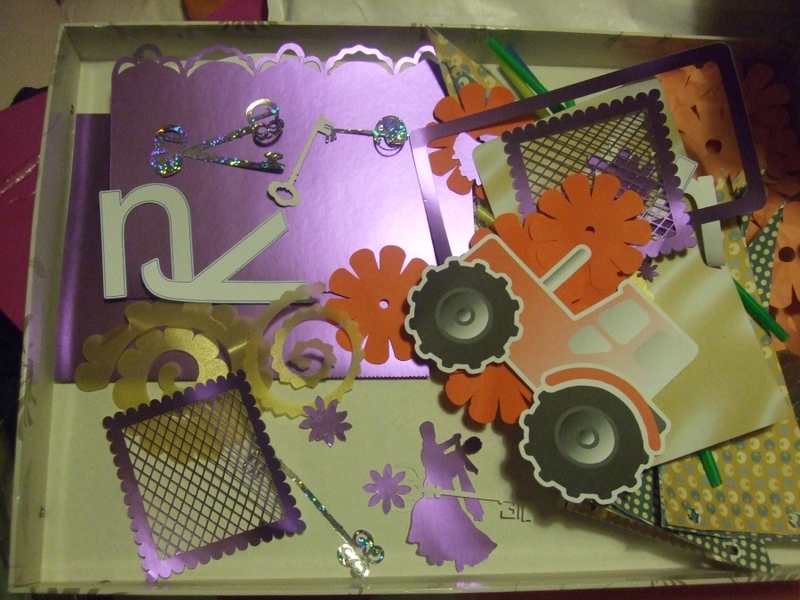 All the decorations were either items or die-cut elements from my crafty stash, or cut out using my CraftROBO. 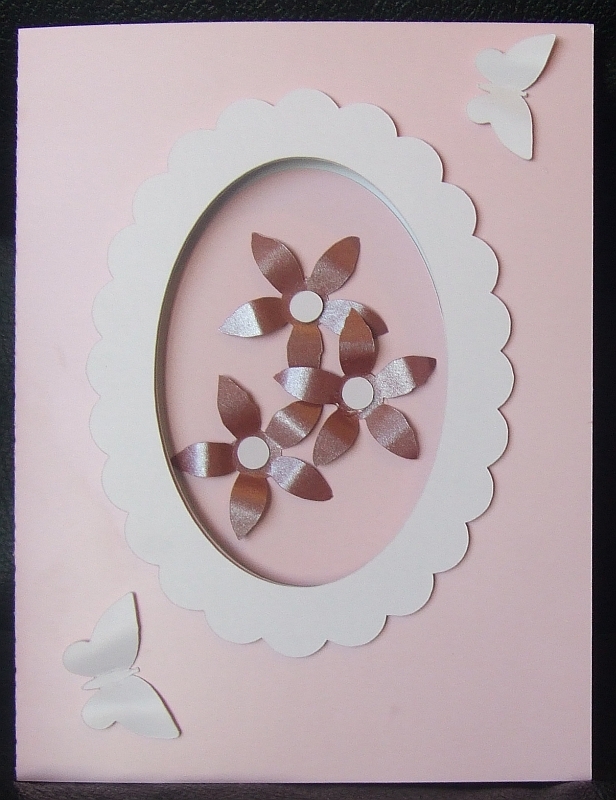 I did use a corner punch on two of the cards, so the only thing I used a scissors for was to chop some foam tape, cut the ribbon and bow on card 5, and to trim the paper ribbon down the right hand side of card 4. 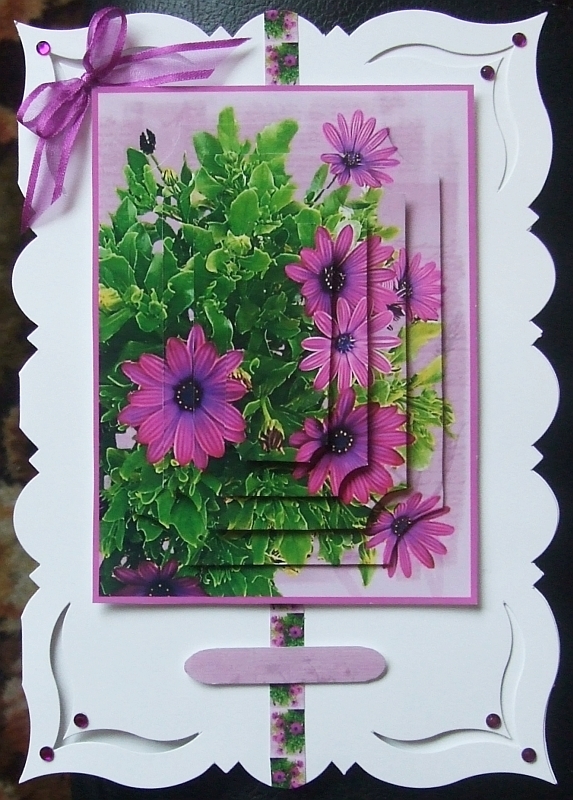 I’ve tried to go for different looks on these five cards even though every one features flowers in on form or another. Crafty Bob’s Tombola – Don’t forget that every new order placed on the craftsUprint site will entitle the customer to a free play on Crafty Bob’s Tombola. Everyone wins a prize! 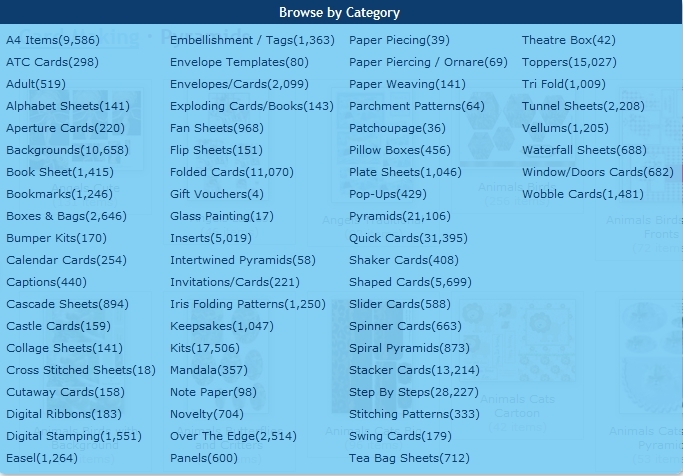 Over £250 in prizes are given away EVERY DAY in the World’s only Crafting Tombola game. 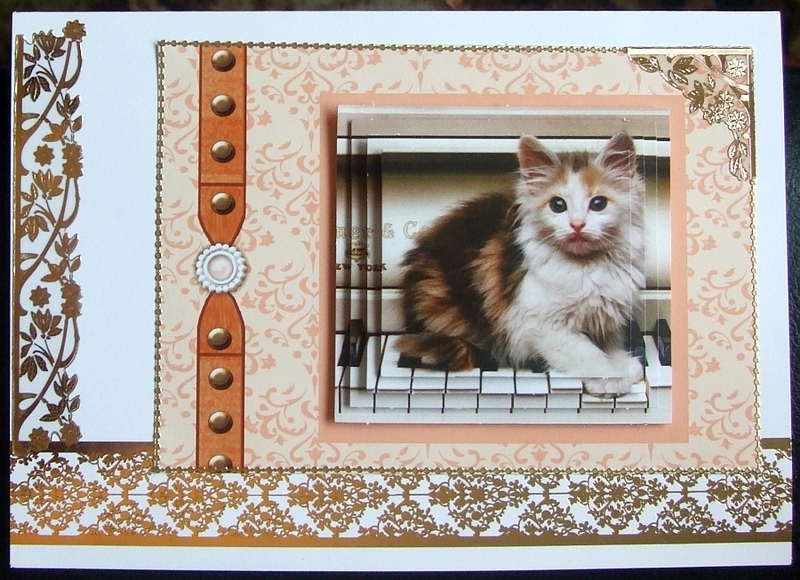 Crafty Bob’s Crazy 5 Minute Game – Have you bought digital designs from the craftsUprint site? Are you keeping an eye out to see if your name comes up giving you a 5 minute window to claim a monetary prize? CUP customers names are being chosen at random and if they are online and spot their name during the 5 minute slot then they can claim the prize. The prize pot goes up every five minutes as the name changes if it hasn’t been claimed. Have a look at the information page – here – to learn more. There’s even a list of those who’ve missed their chance as well as a list of those who’ve won, and what the prize pot that they got was. Crafty Bob’s Bingo – Crafty Bob is currently looking for a FOUR CORNERS AND A CENTRE in Game 71 as I’m writing this, but please click – here – to check the current status, and see the numbers already called, as you are reading my post. Bingo Cards are FREE to all CUP customers. A bit of a variety in this batch. From New Baby to Sympathy. 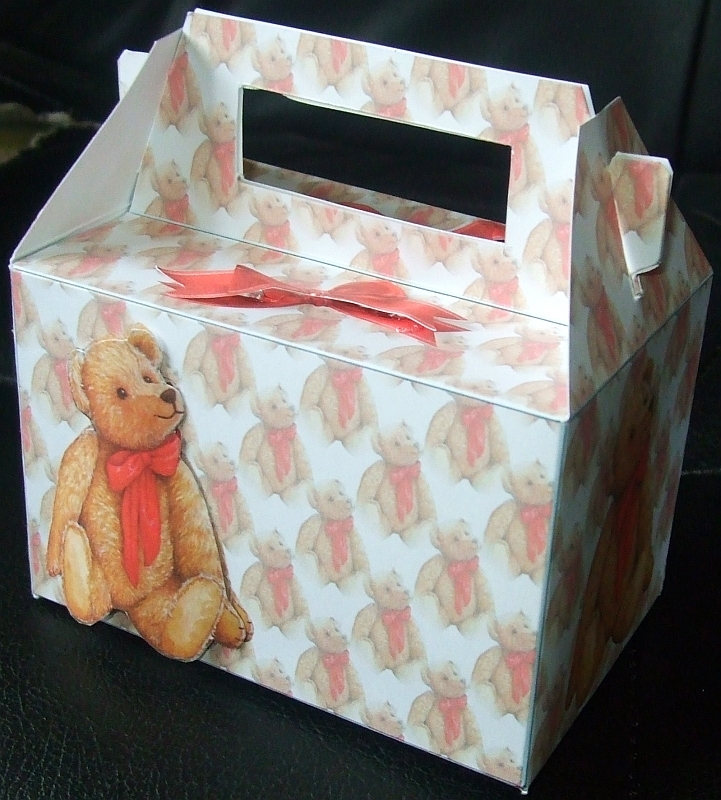 From a card and box suitable for a man to a card and box, with a teddy on, suitable for a child. 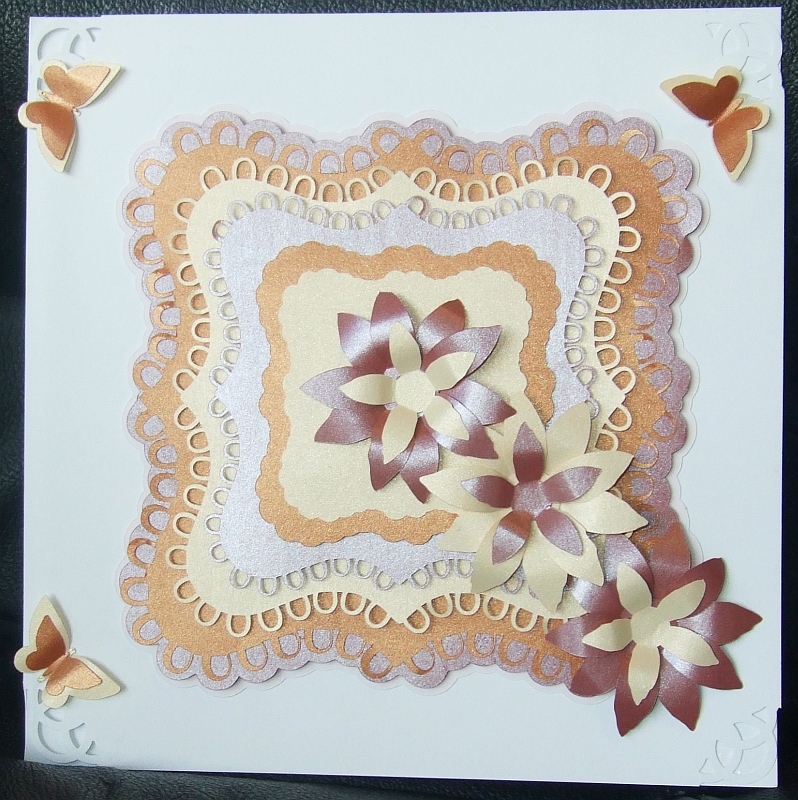 Some more playing around with Designer Resources first, but this time to make a brown toned card, insert and box that’s more suitable for a male than the lace look set in my last post. These are all made from the same items although the shading does look slightly different in the photos because of different lighting conditions when the photos were taken. 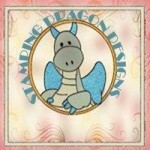 Back to ready designed sheets as the basis for the next batch of cards and the box. CUP Newsletter Mailer – The mailer E-mailed out today, 13th January, can be seen by clicking – here. 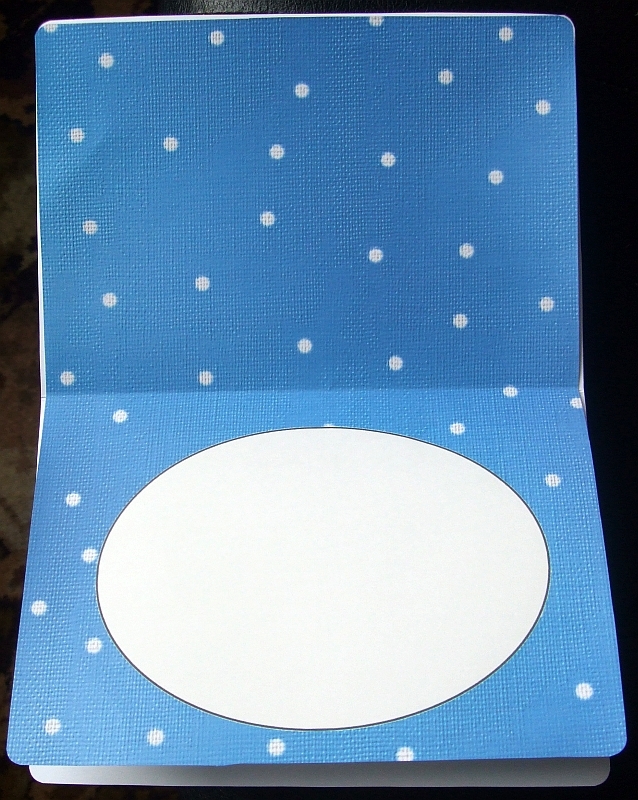 Today’s mailer is given over to the designer Ann-marie Vaux. Ann-marie is only the third CUP designer to reach the Titanium status, and getting to be a Titanium designer means that a total of 50,000 sales of her designs have been made via the CUP site. Now that is a huge number of sales and just proves how popular the items that Ann-marie designs are. 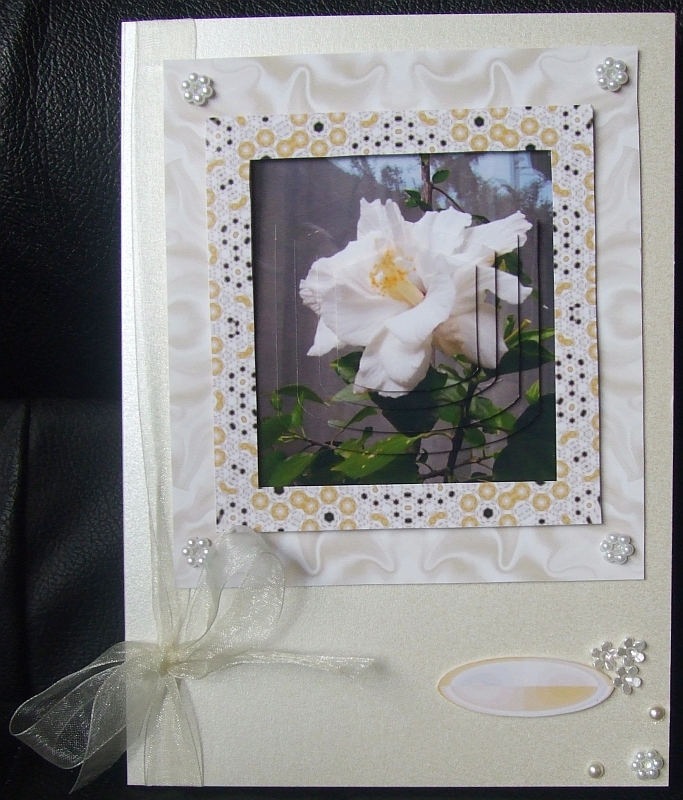 These are a small number of the cards I’ve made using Ann-marie’s designs. 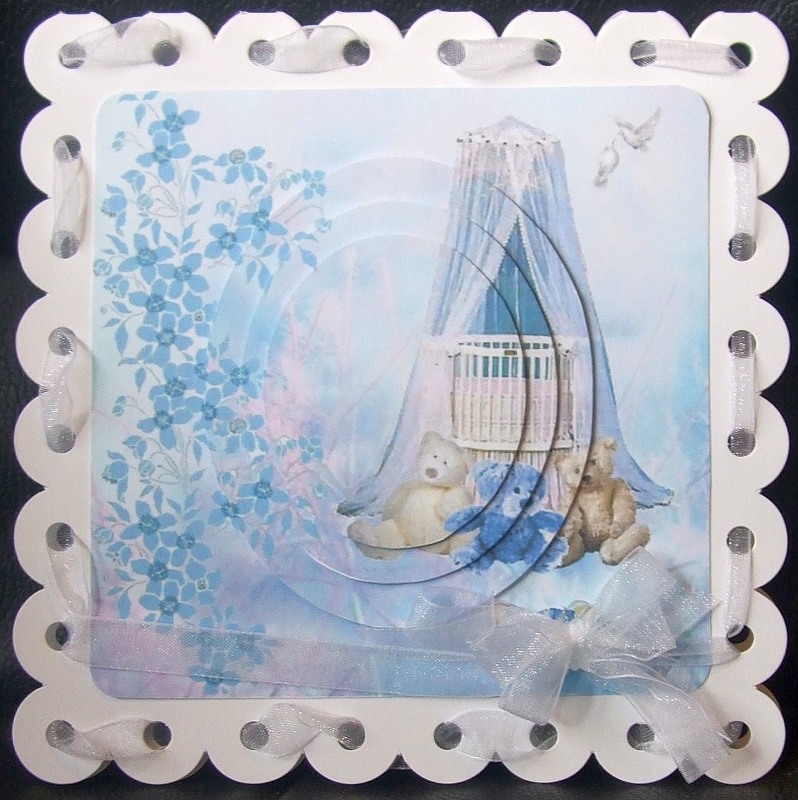 Card Making Competition – The Crafter of the Year 2011 has been announced, and the winner was Margaret Mccartney, the runner Up was Dianne Jackson, and the person in 3rd Place was Angela Styles. I finished at 24th with 38 points. Thank you so much to all the CUP Designers who voted for me. If any body would like to see the leader-board of the top 40 places crafters then click – here.